I've reviewed many cosmetic circle lenses before as well & I really enjoy using them. Circle lenses do give a different look to your eyes altogether, making them look beautiful! 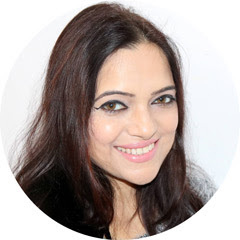 I discovered another fabulous website- Freshkon where you get such amazing lenses & the best part is that they are available in more than 50 countries including India! I got two pairs of color lenses from Freshkon..take a look! Today, FreshKon holds true to the love affair it began with beautiful eyes -a romance which, many years on, is only just beginning. Widely renowned for its flagship labels- Alluring Eyes and Colors Fusion -whose resounding success turned them into household names, FreshKon spreads its gaze over 50 countries worldwide. Match them with your mood, your whim, your life! The color fusion lenses range is available in two types- Dazzlers & Sparklers, both have lovely colors but I chose two shades from Dazzlers. They arrived so safely & within two days. The packaging as you can see is quite different from the other lenses that I've reviewed till date. They come in compact cases rather than those bottles. I feel that this one is better because the bottles can even break but not these. Apart from this I also got a case with a mirror for keeping one lens case. A pair of forceps surprised me because I never found it in any of my other lenses. The packaging really impressed me & you can say at your first glance only about the high quality of this company. Now onto the lenses which are so comfortable & easy to wear! I can say that they are the best quality lenses i've worn till now! I never felt any irritation in my eyes whenever I wear them. Besides that they look so natural & give a beautiful look to your eyes. Cool green as the name suggests is a cool toned natural green color lens. If you have hazel eyes, this'll add a greeninsh tint to it. Similar is Baby Aqua which gives a lovely bluish tint. 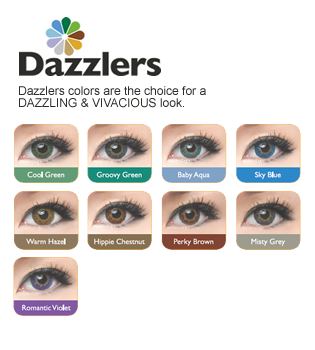 All the colors in this Dazzlers range have very natural shades which do not make your eyes very dramatic but make them look natural. Give a very natural look to the eyes. The packaging is superb with great attention paid to hygiene. I didn't find any cons in any pair except for the fact that I didn't find the price on their website. Finally I would say that these are the best lenses that i've used till now! The packaging gave a fabulous first impression & after that even the quality of the lenses proved to be fabulous! If you like wearing lenses then this is surely a website that you need to check. It's available in India in many stores in Mumbai, Delhi etc.